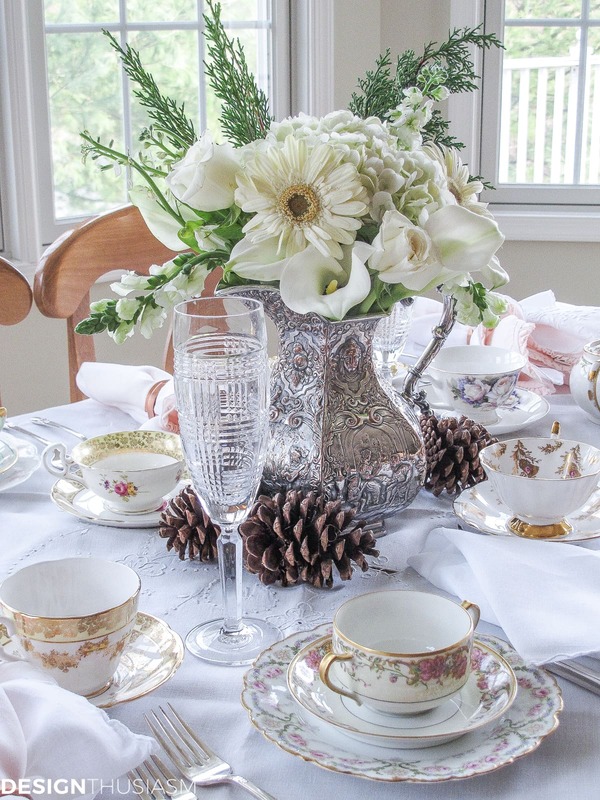 In this post: An afternoon tea party is a delightful way to celebrate a winter afternoon. 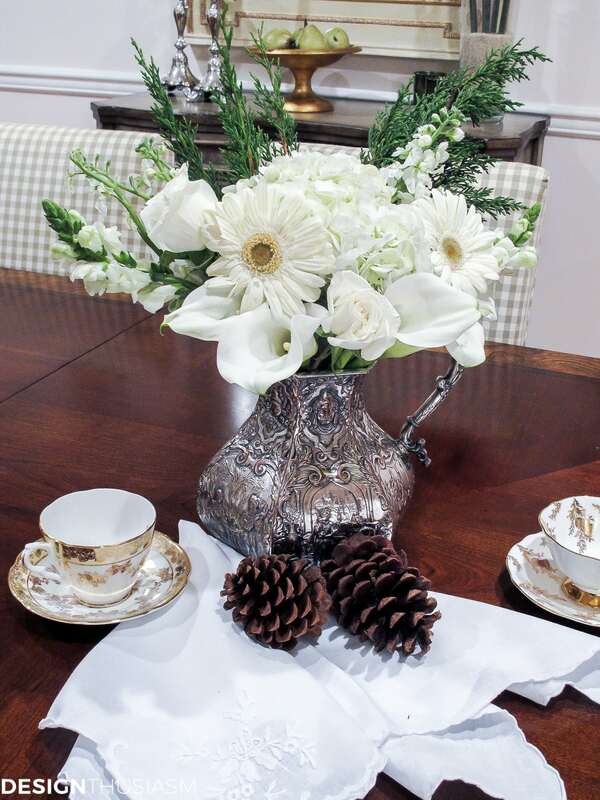 Here are tips to help you set a pretty table with a winter bouquet. 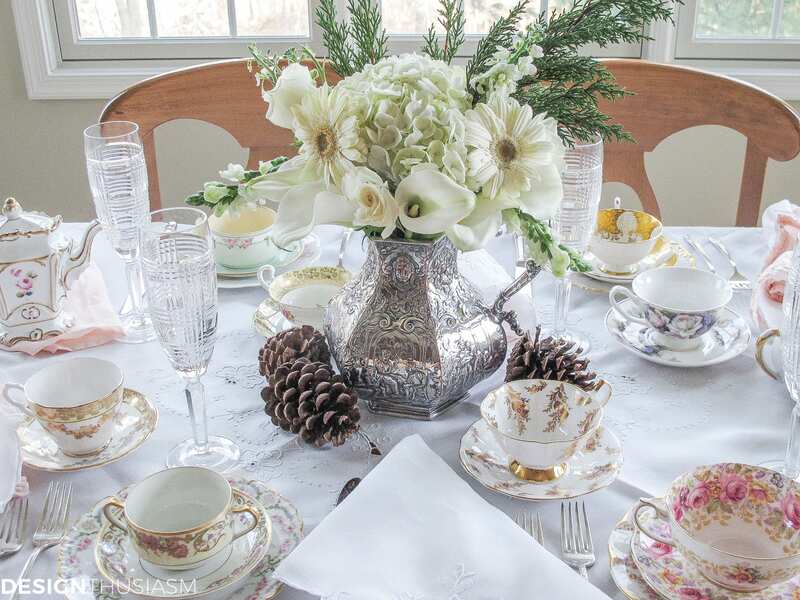 One of the most delightful ways to spend a winter afternoon is to host an afternoon tea party for a group of friends. 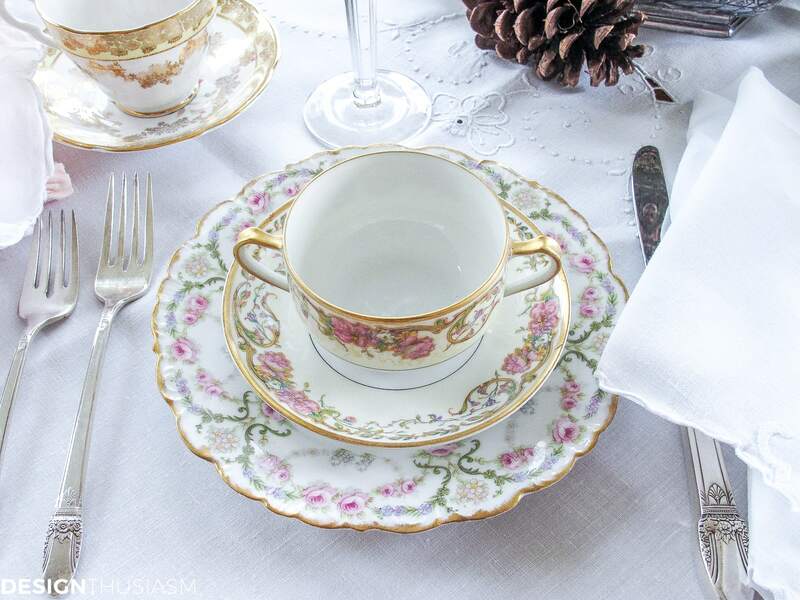 It’s the perfect time to bring out your vintage china and set a lovely table with some favorite pieces. And what better way to incorporate seasonal flavor than with flowers? This is particularly true in winter when we are craving a bit of beauty and ‘life’ indoors. Flowers can impart the colors of the season, as well as the general spirit, so I’ve arranged a winter bouquet for this afternoon tea party. January isn’t the easiest month to find flowers at the market but I managed to pull together a lovely grouping of varied winter white varieties. 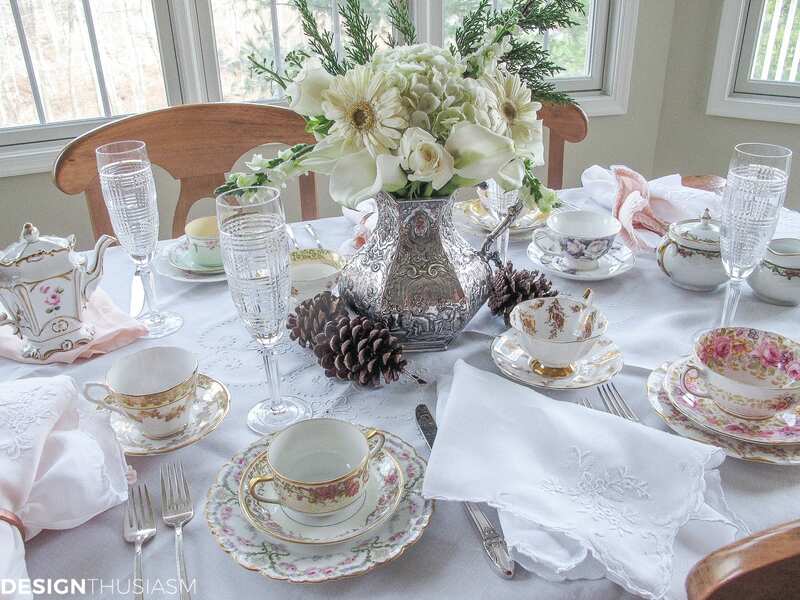 The table is set with my beloved vintage china collection and the soft colors contrast nicely with the bits of nature provided by the pinecones. 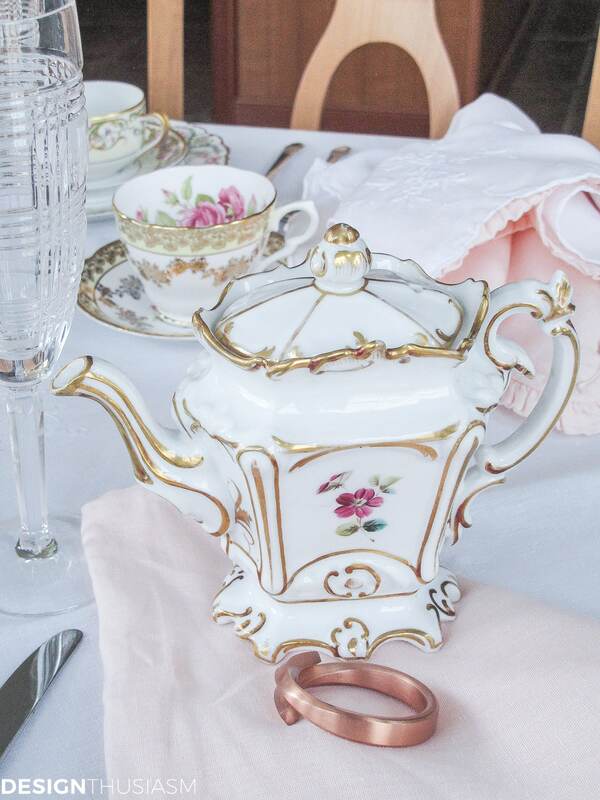 The floral theme is picked up in the delicate china, as seen here in this vintage teapot. I selected my lightest and whitest china patterns to keep the table feeling especially wintery. 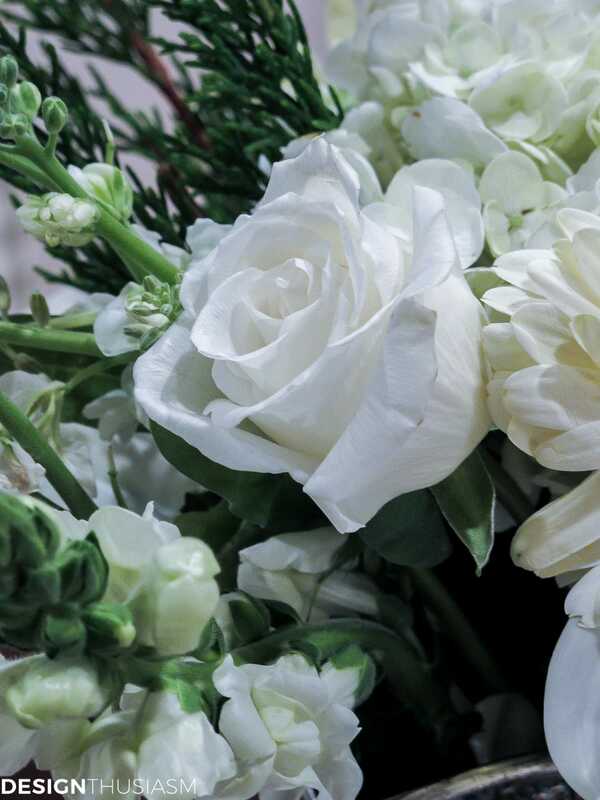 Roses seem to be available all year round and I tucked in a few creamy white ones throughout the arrangement. You can also see the lovely white calla lilies acting as a bit of a sculptural base upon which to build the rest of the presentation. They add interesting lines and feel more durable than the softer flowers they appear to bolster. 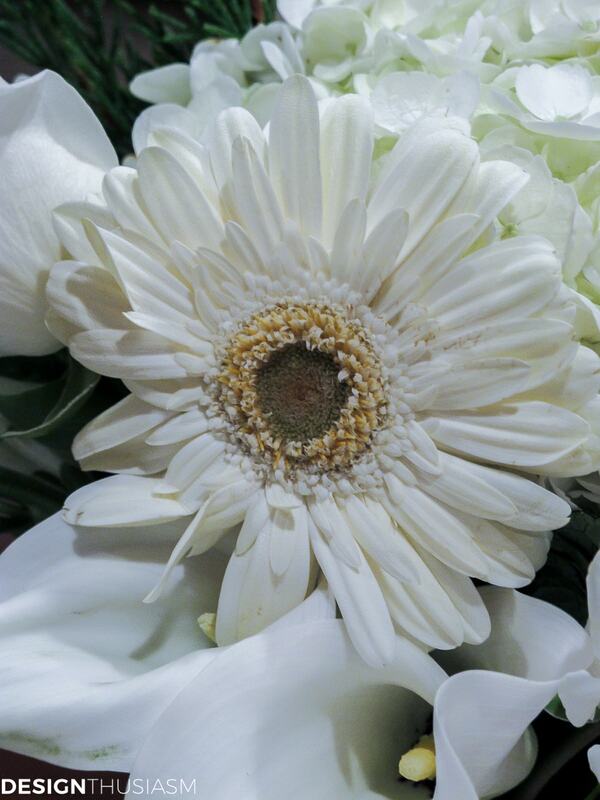 For a touch of fun I included some gerber daisies, which always seem to be smiling and saying good morning. On the table each place is set with a small soup bowl in addition to the teacups. What better way to add warmth to a winter day than with hot elixirs like soup and tea? Here you can glimpse the mix of flowers working nicely with some winter greens. The vase is one of my vintage pitchers in a silver repoussé pattern. 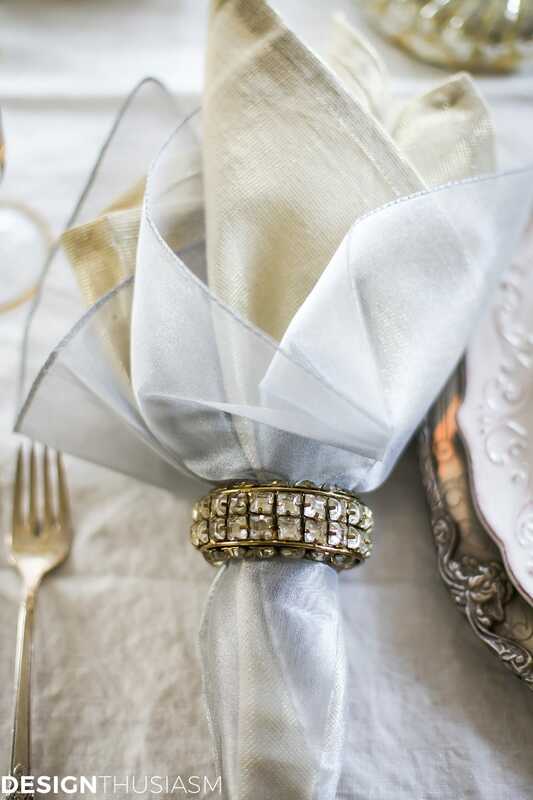 Soft linen napkins nestled in a copper ring keep the tone seasonally white. I always love to add some taller flowers for height and interest and love the way they drape over the edge. I’ll need you all to let me know in the comments what these are called. The full effect is pretty and uplifting, but unmistakably says winter to me. 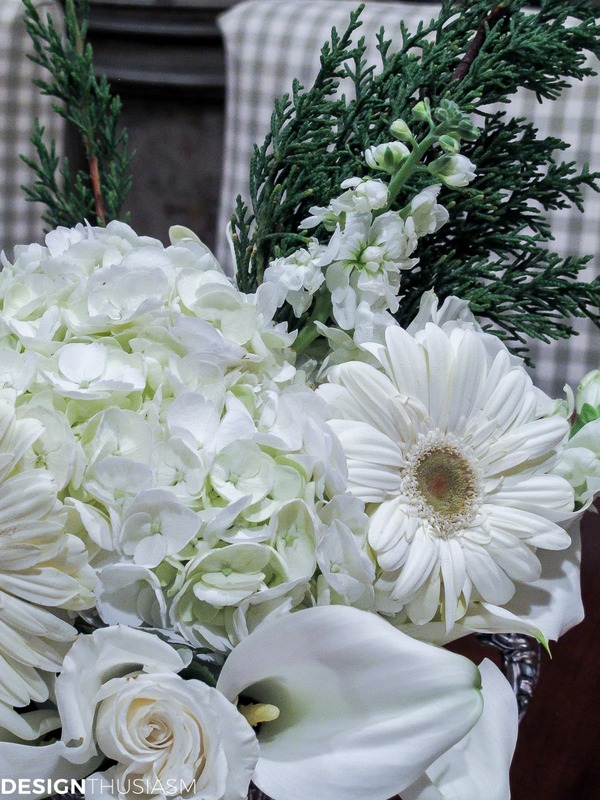 Perhaps the ring of pine cones helps with that effort, but so does the all white winter bouquet. How delighted I am to keep fresh flowers in the house all year long! And after the tea, they can move seamlessly into the dining room where they contrast beautifully with the dark rich woods of the dining table. Here’s hoping you all stay warm this winter! Hi Lory! I love this tea. It is so beautiful and such a nice treat for friends in the dead of winter. Yes, you can link a linky party to the Home Sweet Home party. I have never restricted it and I feel it is all about sharing the wealth anyway! 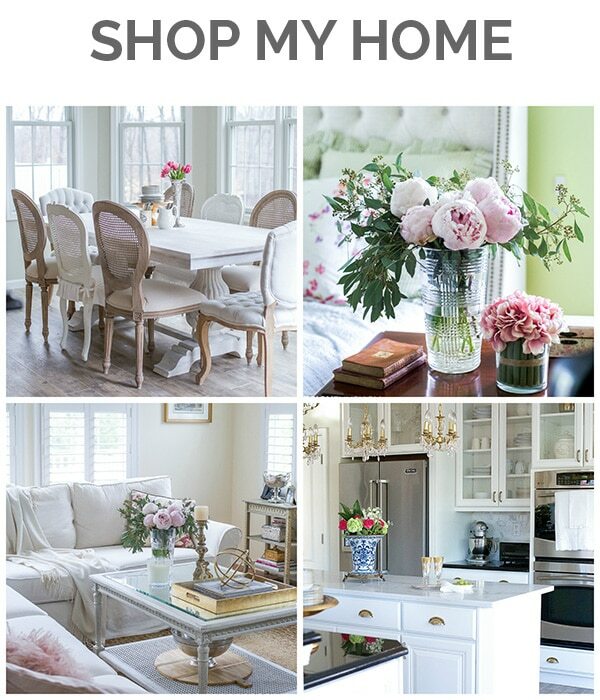 Have a wonderful start to your New Year and thanks for sharing this at Home Sweet Home! The tall white flowers are snapdragons; your tables ape is spectacular! Very pretty. Those tall flowers are snapdragons. My mother used to always plant those and we loved to play with them since the flowers part pulls open, then snaps back close when you let go. 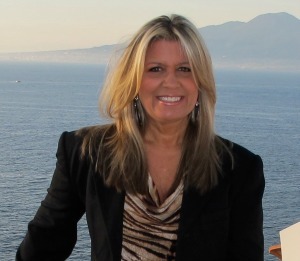 Thanks for the info Sandy, as well as the kind words! This one was fun to play with… 🙂 Thanks for stopping by!! Just lovely. The Gerbera Daisies were a nice touch. The lovely flowers are called “stock”…pretty apt name for a flower who fills the background and looks and smells lovely!! Blessings to you in this nice new year!! Lory, what a pretty tablesacpe! 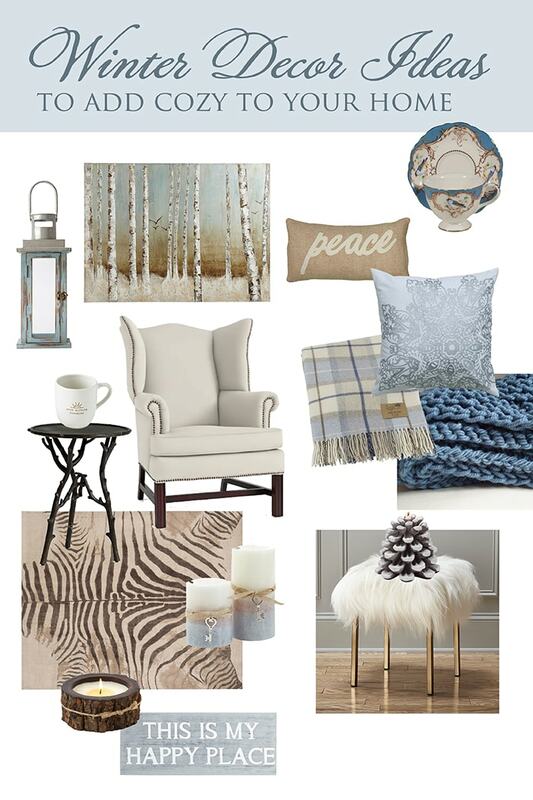 Gorgeous silver pieces, especially that lovely flatware. Love the napkins and the tablecloth too! Thanks so much! The flatware was hubby’s grandmother’s. As much as I love to find things in antique markets, it’s twice as special when it came form a family member… 🙂 Thanks for visiting!! Hi, I love absolute everything about your table! I like that you always use fresh flowers! I get inspiration from you! Thanks! Thanks!! 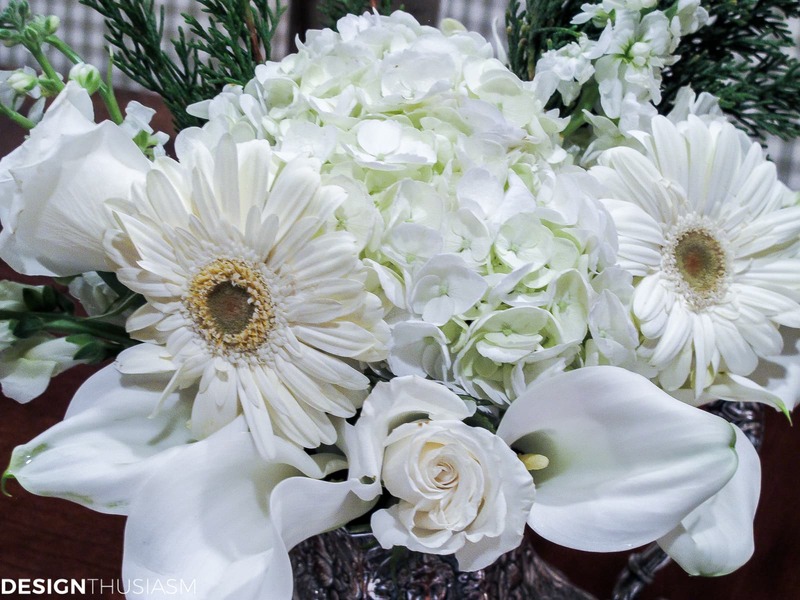 I do love fresh flowers… 🙂 I use plenty of faux around my home, but try to always have fresh on the tables. 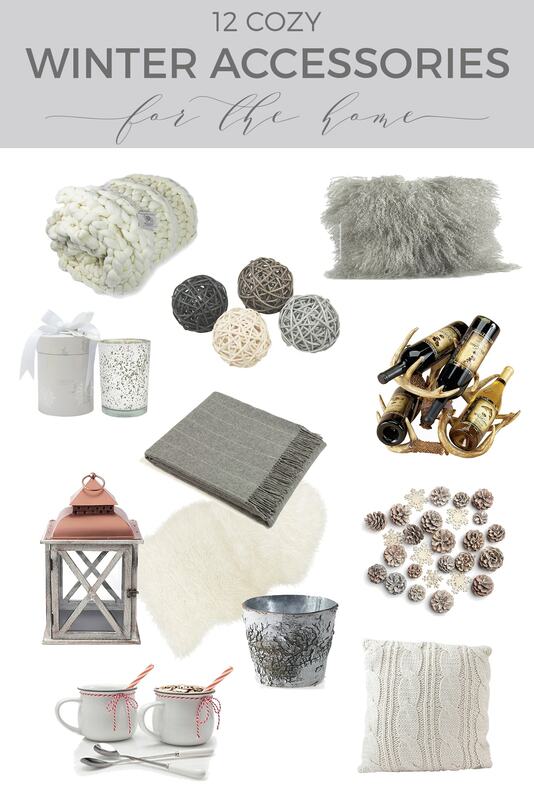 It’s not so easy this time of year, but if you try hard, you can find a nice grouping to put together. I actually bought hyacinths this week! No idea why they were available, but oh, how I love the scent!! Thanks for visiting. Lory your tea table and flowers are so beautiful. I love seeing your vintage flat ware, as it always reminds me that my mother had that exact pattern named, “First Love”. Omg, Pat, yes, that’s the pattern!! They were my husband’s grandmother’s and my mother-in-law wanted us to have them because of the name of the pattern. So romantic… 🙂 How fun that you know the very same pattern! Hi, can you tell us the name of your vintage tea cups? 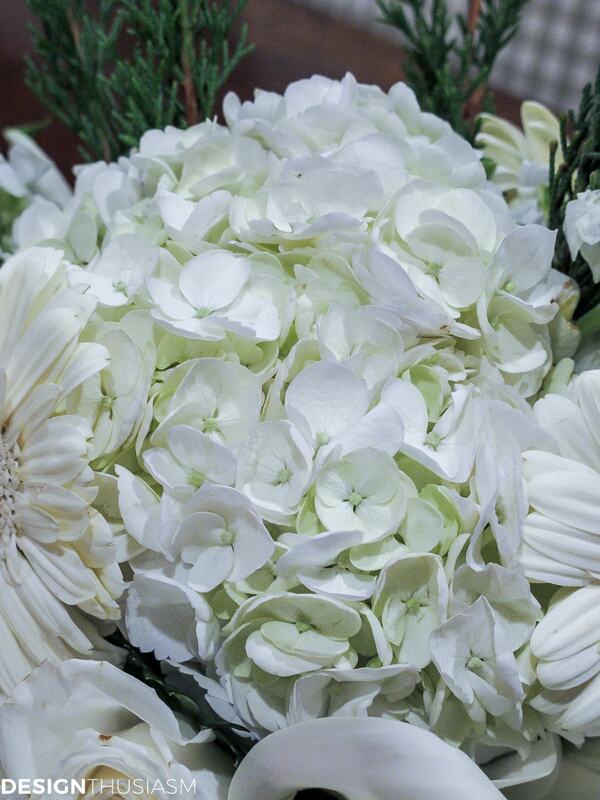 Gorgeous flowers all in white, dear one!!! I absolutely love calla lilies!!! Hot soup and tea sounds simply divine!!! Thanks, Pat! Sounds like you enjoy the same things I do… 🙂 I was really going to just photograph the floral, but then decided to set the table and out came all of my favorite vintage items!! Your tea table is so elegant and stunning! 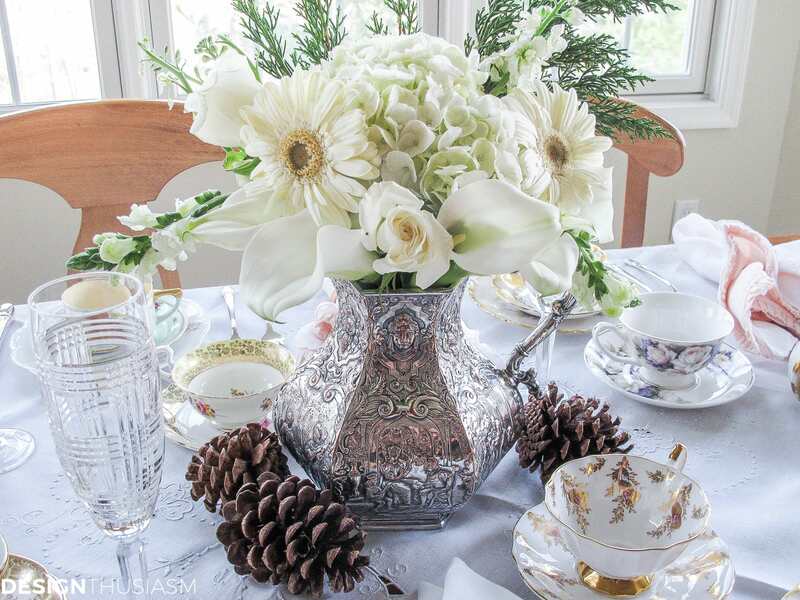 The pitcher centerpiece with the white flowers for Winter is gorgeous as are the pretty teacups here. Perfect and I’m pinning. PS: I wanted to follow you but couldn’t find the follow button. Thank you so much, Fabby!! If by ‘follow’ you mean subscribe, you can do it several ways. There’s a subscribe bar at the very top of my page in a blush pink color. There’s also a subscribe box on the sidebar. And finally, when you are leaving the page, there should be a pop-up box to subscribe. But if you mean follow on social media, there are grey buttons on the top of my sidebar that link to my Instagram, Pinterest, Facebook and Twitter. If you’re on a phone, you may have to click ‘view as full page’ or something like that to see the sidebar, but the pink subscription box is always there at the top. Thanks again! 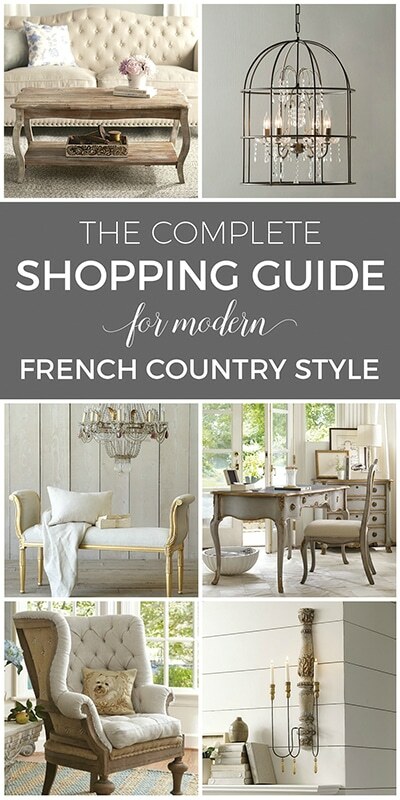 Hi Lory – just discovered your beautiful blog on Facebook (Swedish & French Decorating page). Would love for you to share this stunning table on our Table It link party!! Heather, Thank you so much! So funny, I was just reworking my Link Ups and thinking I needed to get back to Table It. Had no idea it had grown so, but I used to love that party. Will definitely join next week… 🙂 Thanks for the kind words, as well!! I’ve seen you in the Facebook groups but hadn’t visited your blog either, so now I’m delighted to have found it! Btw, I also do a large link party on Saturdays – Share It One More Time with a group of 5 other bloggers. We are very much looking for more decor and DIY entries to feature. 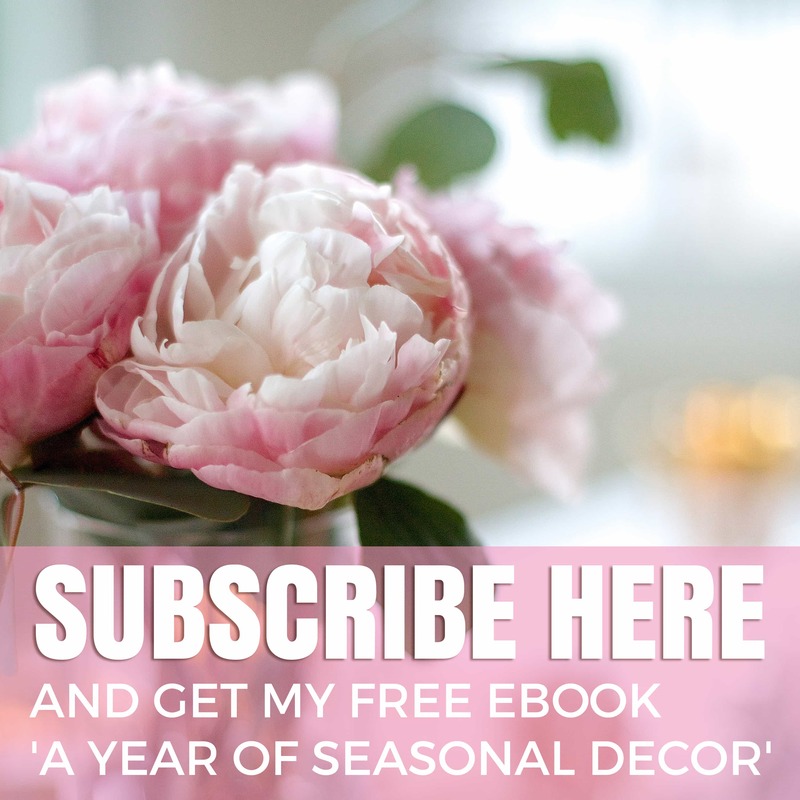 We’re pretty large, but a lot are recipes and since we are all decor bloggers, you have a very good chance of being featured if you’re doing decor or DIY. 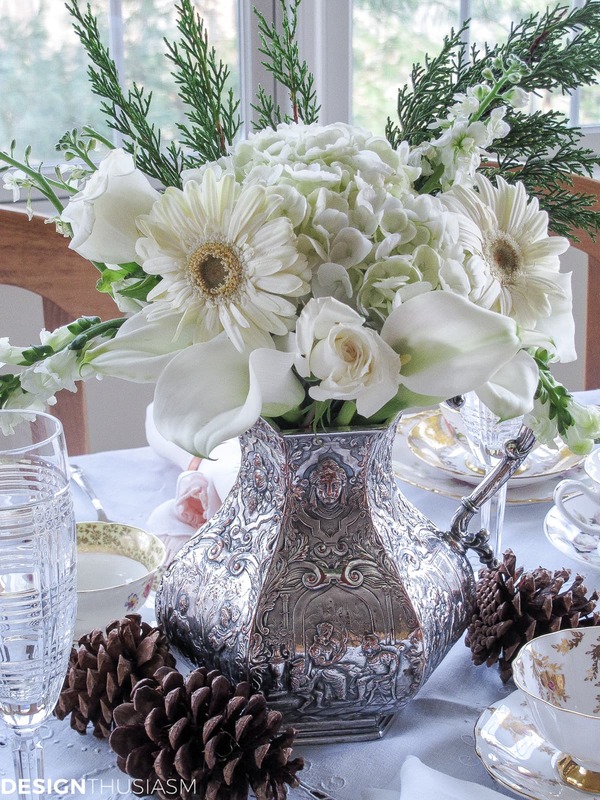 Stunning table Lori, I am having a serious crush on that silver pitcher! Aw, thanks so much, Christine! Lory, as always, your table is stunning! But I’m a little worried about you. You placed the flatware as society dictates! Are you ok??? Haha, great comment!! Yes, in this case there’s no plate stack or napkin cluster, so there was room for flatware… 😉 Thanks, Ginger!! What a lovely setting. 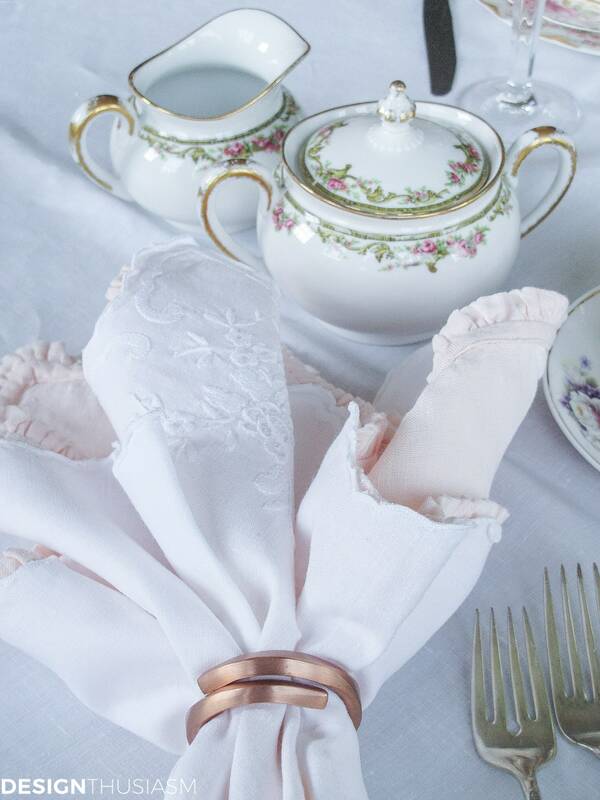 I think a tea party would be fun and give me an opportunity to use my fine china. I love the winter white flowers and that pitcher is to die for. What did you serve the ladies? Thanks so much, Joanna!! I like to serve gourmet sandwiches for a ladies lunch, so that’s generally my go to menu. It works well with tea and there’s a place nearby I can get them from. I cut them in fours so they are like little tea sandwiches. That brings back fond memories. My mom loved to host luncheons. I remember the lovely table setting and cucumber sandwiches with the crusts removed. I wanted to add that you don’t seem to be popping up in blog roll. Can you check and see if the problem is from my end? Should I resubscribe? What is blog roll? If you are getting my emails, then you are properly subscribed… 🙂 I have one going out Wednesday, so make sure you get that one. I’m was not getting your posts, so I resubscribed. I only fell upon you through another blog and then wondered why I was not receiving them myself. I’ll see if you are there on Wednesday. 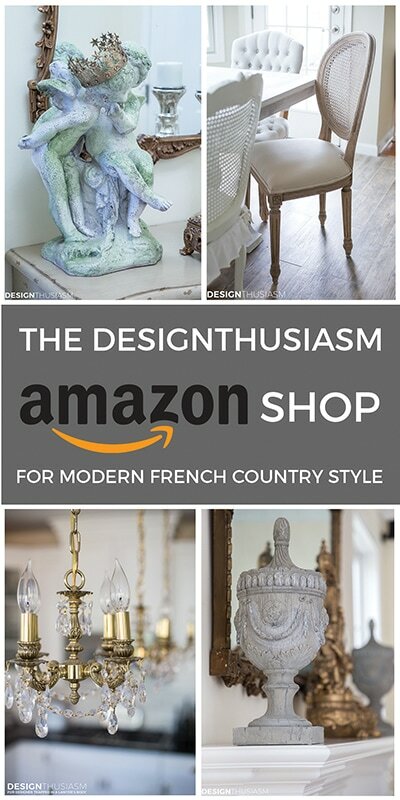 I really love that repoussse pitcher and of course, the whole tablescape! You always use such lovely flowers and interesting china. Thanks for all the inspiration! Your table setting is soooo pretty, Lori! 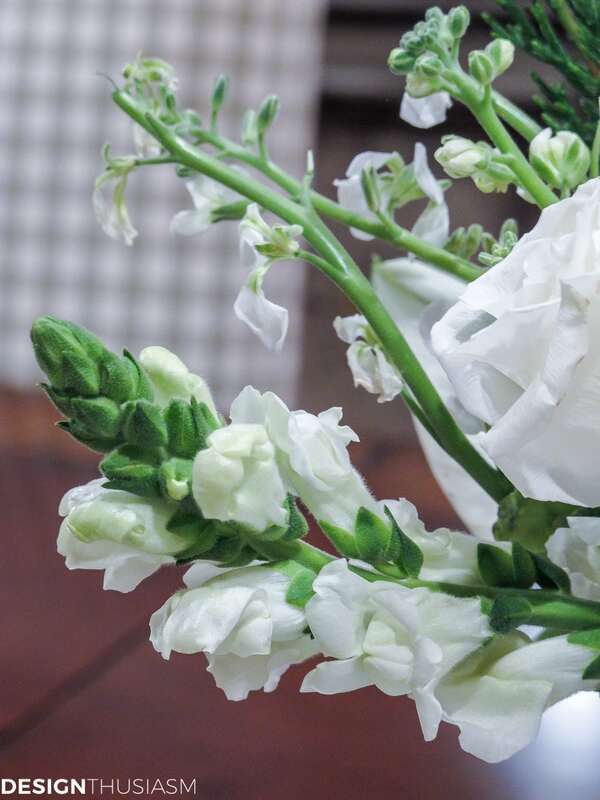 The flowers are lovely… The one you weren’t sure of the name is a white snapdragon. I was always planting those in the winter in California and the scent in the evenings was heavenly and soft… <3 I taught my kids to pinch the snapdragon's individual heads in the "jaws" to make them talk ~ I gave them their own personalities when we'd stop by Lowe's or Home Depot's garden shops making each little snapdragon face "talk." Thanks for the fun memories! Thank you so much Barbara, for the kind words and the info on lovely snapdragons! !